It was an overcast day, and this color combination was calling me in the morning!! (Yes, my tichels sometimes talk to me… don’t yours?) There’s something about rust paired with brown… it’s so earthy and warm! I felt so “at home” in this and it nurtured my soul! Definitely something I’m going to ry again soon! 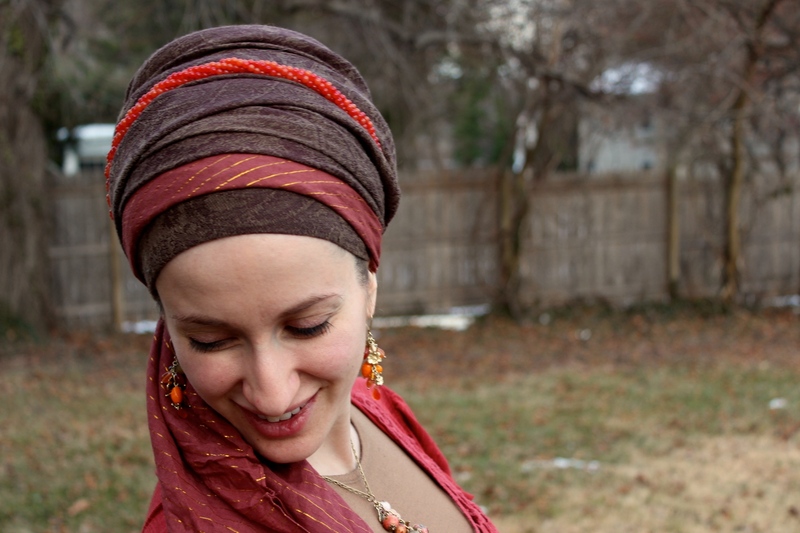 Because I know you’ll ask, I’m wearing a brown soft pashmina, burgundy/gold Israeli tichel (these are AWESOME! ), and a beaded twist necklace made into a headband by the regal clasp! I know that many of you are going through some crazy rollercoaster times right now… and I want to let you know that I’m with you and sending you so much love! Hang on tight! Keep at it – and have you joined the wrapunzel fangroup on facebook? It’s an awesome place! I have no facebook account…but the fact that you have a fan group on facebook, almost makes me want to join up!!! 🙂 and even then, I’d be out of my league…but I will continue to try nonetheless…you make headcovering so much fun..and so beautiful. This looks so flattering. The colors, the way its tied, altogether very pretty. This is so flattering. The colors, and the way it is tied is very pretty. Hi Maria, you won’t guess but I was also in your shoes. If it was not for Andrea and Rivka the “wrapunzel sisters” I would have been lost. As the saying goes “practise makes perfect” and now my husband think I am a princess because of the beautiful tichels I am wearing.